We don't claim to be zombie apocalypse experts, but we do know if it happens prop guns and an old Isuzu probably isn't going to be a very helpful combination. That certainly isn't what the seller of this 1994 Amigo would have you believe. It's currently listed on Ebay as a vehicle that will "have you ready for the impending zombie apocalypse". 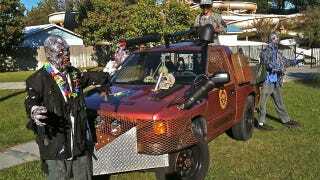 Starting with a well used 1994 Isuzu, the builder of this interesting "Custom Zombie Response" vehicle added a variety of prop guns, pieces of spare metal and other assorted accessories to create their idea of the ultimate anti zombie prop vehicle. The result is a slightly rusty Amigo with all sorts of weird things attached to it. To us this Isuzu looks like an ideal prop vehicle for a horror theme park or comic conventions (which is what it was built for), but it's hardly zombie proof. It's too slow, too small and it lacks the genuine artillery you're going to need to fend off the undead. Admittedly, the custom Zombie catcher up front could come in handy, but we're still not sold. It appears the savvy buyers on Ebay Motors also question this Amigo's real world zombie killing capabilities. With 3 days left the bidding is at $532, quite a distance away from the $10,000 the seller expects. Prop vehicles are fine for now, but when the real zombie apocalypse hits you'll still find us armed to the teeth behind the wheel of a genuine undead response vehicle.